THE KINGS LYNN MART NORFOLK. 1974. Town hall dignitaries ride the dodgem bumper cars, free of charge after the opening ceremony. The site of the fair is the Tuesday Market Place with the Mayor and Chairman of the Markets Committee accompanied by local dignitaries and officials of the Showmen's Guild performing an opening ceremony. 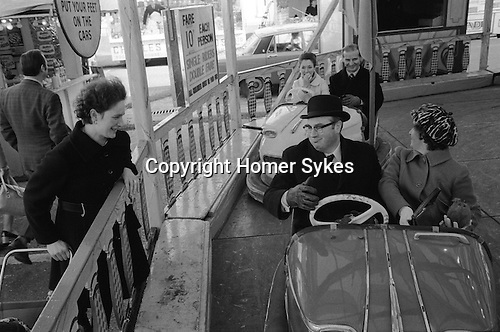 A town hall official takes a turn on the Dodgem Bumper cars. This Valentines day fair is traditionally the first showman's fair of the year. Location: KINGS LYNN MART NORFOLK.